I turned 40 a month ago and had the goal of running in the Boston marathon to celebrate this milestone. Last year (April 2012), I ran in the Knoxville marathon to try to qualify. My dear friend in Tennessee, Kim Kredich, dressed up as Glinda the Good Witch from the Wizard of Oz at mile 5 to cheer me on. She was there in all her glory with her pink ball gown and red running shoes blowing bubbles as I ran by. When I got the time I needed to get into Boston, she sent me a congratulatory email that was titled, ‘There’s No Place Like Boston!” To continue the theme, I decided to dress up like Dorothy for the Boston 2013 marathon. 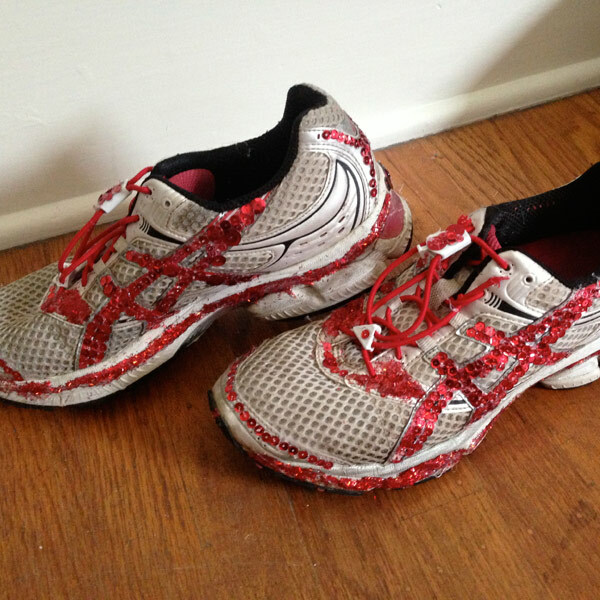 I got to taste the incredible Boston spirit this year dressed up as Dorothy running with a sign on my back that said, “There’s No Place Like Boston!” wearing ruby red running shoes that my children helped me make by hot gluing red sequins on my shoes. Needless to say, I got so many fun cheers from people telling me to “follow the yellow brick road” along the way and yelling “GO DOROTHY!” at the top of their lungs. One highlight was that the girls at Wellesley (who are known for their kisses to runners as they pass by) sure know how to show spirit at mile 12.5, and they passed on high fives and cheers to me that gave me so much energy and joy that I thought I just might burst. There were several profound parts of the morning during my run. I read a book last year by Kristin Armstrong called Mile Markers: The 26.2 Most Important Reasons Why Women Run, and she shared that in one marathon that she and a friend wore pace bands listing split times and “prayer intentions”- the names of people to honor on each of the 26 miles. As I was running Boston as a celebration of my 40th birthday, I loved this idea and had a list of people who have been significant in my journey. It was powerful to have these people to give thanks for and to celebrate along the way as it really helped me and gave me a focus that was inspirational especially in those difficult last miles. 1 Corinthians 9:26 says, “So I run with purpose in every step…” The prayer offered for us marathon runners at Trinity Church of Boston yesterday rang true “May they feel your delight in each stride,” and I found myself praying that this same delight and deep sense of our belovedness would be a daily reality for the friends and family listed on my bracelet among other things that came to mind for them during my run. It was also an opportunity when I was struggling to dig in and pray for endurance and perseverance for those who are going through tough seasons. I crossed the finish line, took a picture, got my medal, grabbed some Power Bars, and headed to the buses where they had brought the runners’ items from the start to the finish. From there (only 15 minutes later), I saw the first explosion down the street. We all stopped and wondered what it was. One guy standing there was a Boston native and he thought it might have been something that burst with the sewer. Others speculated that it was something with the subway, a transformer explosion, or a cannon for Patriot’s Day. I so wanted to believe these things, but it seemed too big for something like that. We headed to a hotel lobby to regroup and try to find some friends, and then we began to hear the news. At first it was reported that no one was killed and that just some people had been hurt. Then news then began to spread like wildfire. With Facebook, Twitter, and texts coming faster than we could keep up with, we were finding out the details of what happened. It seemed that the outside world had a better idea of what was going on due to news that was being broadcast that we did not have access to yet since web service was on overload in Boston and we could not find things out as quickly. Upon hearing the news of the injured and dead, I wept. How can this be? A day that began as the “greatest day in Boston” has ended as a nightmare. I have cried many tears in the last few weeks—some in gratitude and joy that I crossed the finish line because I was so thankful that I got to run in such a celebrated and amazing event … and then tears of sadness and devastation at the news of the bombings. knowing that there are spectators who lost their limbs … Even though stairs are a bit painful for me after the race, I still have a healthy body and the gift of my limbs. Why do I get to walk away from all this and others don’t? I am not sure why I get to take a breath now and put on my ruby red running shoes again tomorrow … all I know to do is to be grateful and to pray for mercy.